The Rexel Auto+ 100M Micro-Cut Shredder is a high security auto feed shredder that helps you save time by automatically shredding up to 100 sheets of 80gsm or 150 sheets of 70gsm paper. Each piece of A4 paper is shredded into approximately 2000 2 x 15mm pieces giving the shredder a P-5 security rating and making it suitable for highly confidential and secret document shredding. With the Rexel Auto Plus 100M, you don’t even need to remove staples or paperclips - and there’s no need to stand and feed it - you simply load up to 150 sheets and leave the shredder to get on with the job. Bin capacity is 26 litres which allows you to shred up to 280 sheets before the shredder needs emptying - and as well as paper the shredder will also shred credit cards too. Other features include: a viewing window so you can see how full the bin is (and check all sheets have been destroyed); a handy manual feed option for shredding up to 6 sheets; Continuous Jam Boost Technology to help clear paper jams (the shredder automatically reverses and forwards the engine three times in order to do this); a reverse option; bin full indicator to alert you when the bin needs emptying; door open, paper-jam and cool down indicators; the option to use environmentally friendly paper bags for easy recycling of paper; a 225mm paper entry width (for A4 paper shredding); a self-cleaning cutter process that automatically runs after each bin change (the shredder will run in forward for 4 seconds, stop for 2 seconds and then reverse for 4 seconds to clear any remaining paper from the cutter mechanism); quiet operation at less than 60 DbA; and Intelligent Power Save (the shredder automatically shuts down after 2 minutes non-use). 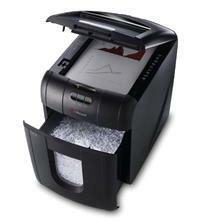 This shredder can be used continuously for up to 10 minutes, after which it will require a 30 minute cool down period. Ideal as either an under the desk or beside the desk shredder, the Rexel Auto+ 100M Micro-Cut Shredder comes with a 2 year manufacturer warranty on the machine and a 10 year warranty on the cutting blades.